Sarah Palin's New Book: "America by Heart"
Sarah Palin's second book will be entitled "America By Heart: Reflections on Family, Faith and Flag." It will be released on November 23rd. That's according to the Associated Press, which cites an announcement from publisher HarperCollins. The former Alaska governor and GOP vice presidential candidate's first book, "Going Rogue," became a monster bestseller, moving more than two million copies. Her latest effort is reportedly focused on American values like "family, faith, and patriotism." The AP reports that, according to the HarperCollins statement, the book will include "selections from classic and contemporary readings" that have moved the controvertial Republican. The nation's founding documents will be included, the publisher said, as well as "great speeches, sermons, letters, literature and poetry, biography, and even some of her favorite songs and movies." Also included will be "portraits" of people Palin admires, including some that she met while on her "Going Rogue" book tour. On that tour, the Fox News contributor made stops largely in the sorts of rural conservative areas she called "real America" during the 2008 campaign. The AP reports that the book will have an initial printing of 1 million copies and retail for $25.99, and that Palin will again work with a collaborator. 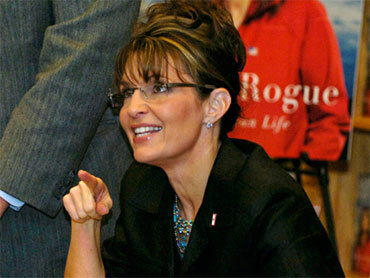 Palin plans to tour in support of the book, which is being released almost a year-to-the-day after "Going Rogue."